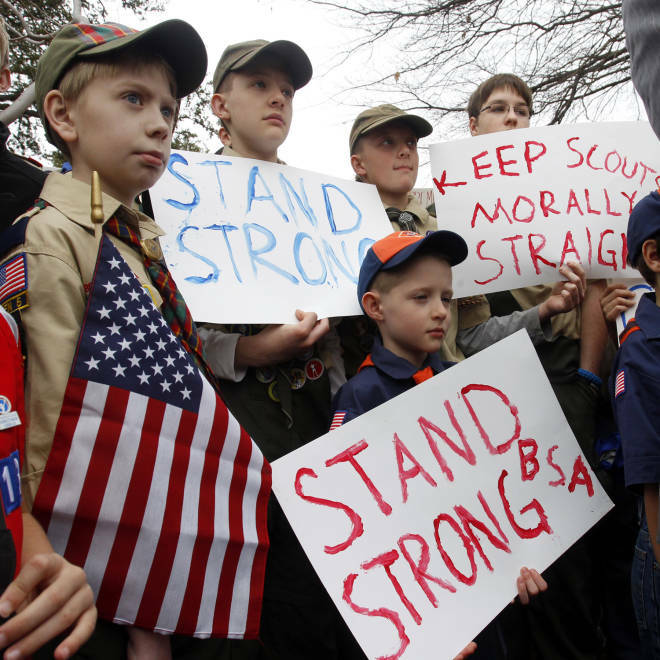 Boy Scouts hold signs at the "Save Our Scouts" prayer vigil and rally in front of the Boy Scouts of America' national headquarters in Irving, Texas, on Feb. 6, 2013. The Church of Jesus Christ of Latter-day Saints has given tacit approval to the Boy Scouts’ proposal to allow gay youth to join, saying they “appreciate the positive things” included in the plan to end the organization's controversial ban on gay boys. “The current BSA proposal constructively addresses a number of important issues that have been part of the ongoing dialogue, including consistent standards for all BSA partners, recognition that Scouting exists to serve and benefit youth rather than Scout leaders, a single standard of moral purity for youth in the program, and a renewed emphasis for Scouts to honor their duty to God." The Mormon church tops the list of membership enrollment numbers, with 431,000 youths participating in LDS-sponsored units as of Dec. 31, 2012. That was followed by the United Methodist Church at 364,000 and the Catholic Church at 274,000. More than 70 percent of Scouting units are chartered to faith-based groups. “For nearly 100 years we have worked together with the mutual goal of building the moral character and leadership skills of youth. We believe kids are better off when they are in Scouting, and the program is successful because of its relationships with valued chartered organizations like the Church,” the statement said. The Boy Scouts’ policy has increasingly been a sore spot for the organization over the last year, following the dismissal of a den leader because she is a lesbian and the denial of the Eagle Scout rank to a California teen because he is gay. The BSA’s National Council will vote on changing the membership policy on May 23. Its biannual “The Voice of the Scout Survey,” conducted earlier this year, for the first time included questions on gay membership. Among the 280 administrative local councils, half recommended no change, 38 percent recommended a change and 14 percent took a neutral position, the Scouts said. "While perspectives and opinions vary significantly, parents, adults in the Scouting community and teens alike tend to agree that youth should not be denied the benefits of Scouting," the organization said last week in a statement. If you are a current or former member of the Boy Scouts and would like to share your thoughts on how your troop, pack or council is handling the BSA's proposed change to the membership policy, you can email the reporter at miranda.leitsinger@msnbc.com. We may use some comments for a follow-up story, so please specify if your remarks can be used and provide your name, hometown, age, Boy Scout affiliation and a phone number.